Mario Kart 64 would be the second game I would own for the Nintendo 64, since I still lived in an era where I only got video games two times a year; one for my birthday and one for Christmas. 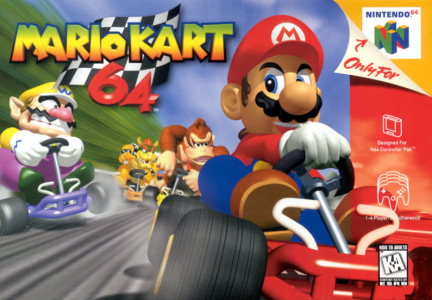 Mario Kart 64 would be my birthday gift since the game was released February of 1997. After reading about the game in Nintendo Power I knew what to expect, but what I didn’t expect was the many times I would play the game. Super Mario Kart on SNES was fun, but I didn’t own the game till later. I did play it at a friend’s house. Seeing that Mario Kart 64 supported four players was a huge deal. We did not have to rely on buying a special adapter, just bring your controller. With Nintendo releasing separate controllers in multiple colors, we didn’t have to worry about playing the game of ‘whose controller is this.’ While racing was fun, it was the battle mode that had us playing the game for hours. The fact we would spend Saturday afternoons playing in a small bedroom with a 15′ CRT TV didn’t faze us one bit with the split screen. Not to mention, the constant yelling as we got hit with items losing our balloons. I considered Mario Kart 64 as one of my favorites from the first game I played with four people simultaneously.